Mercedes-Benz finally fills the gap between the GLA and GLE SUVs with an all-new model, the GLC. Since it's based on the C-Class, the SUV gets a similar character and slightly larger dimensions. However, now it does compare to its immediate rivals. 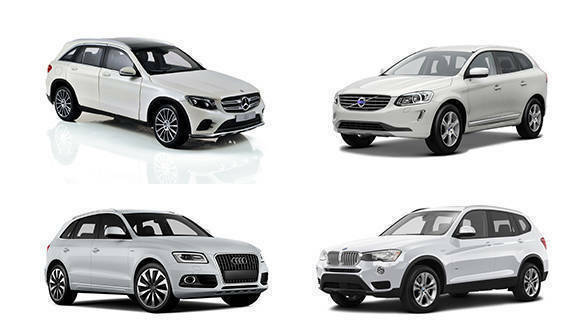 The GLC 220d 4 MATIC goes up against the Audi Q5 30 TDI, BMW X3 xDrive20d and the Volvo XC60 D5. Let's compare Mercedes' newest with its proven rivals. The GLC is all-new as we mentioned earlier, this also means it's the most current in terms of design and technology. The SUV gets the largest engine when compared to its rivals but isn't as powerful as the X3 and XC60 on paper. Peak torque of 400Nm is impressive, only the Volvo betters it. While the rest offer a 6,7 and 8-speed automatic transmission, the GLC gets a 9-speed unit. Only the Q5 though gets a dual-clutch system. Claimed acceleration and top seed is on par with rivals, Standard 18-inch wheels are larger than other rivals and similar to the BMW. While the GLC is longer than the C-Class, its real rivals are similarly sized. In fact the GLC is longer than all its rivals except the X3. It's also wider than its German rivals. Despite only being available with an off-road package, the GLC is the shortest in terms of height. This along with a class-leading wheelbase is what gives the SUV a more estate-like silhouette. The GLC weighs almost 2-tonnes making it the most heavy when compared to its rivals. While the GLC hasn't been launched yet we expect pricing to be competitive. Expect it to undercut a few of its rivals like the Audi Q5 30 TDI and Volvo XC60 D5. NewsHyundai Venue: How does it stack up against the competition?